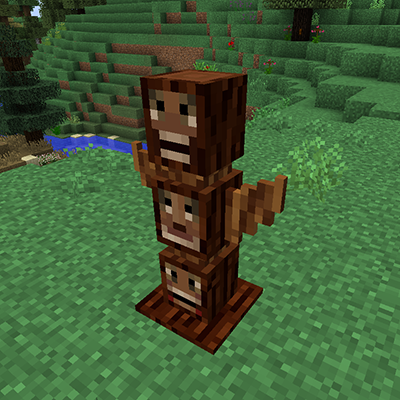 Mod adds 4 totems, which defend territory from enemy entities. Totems are configured by configuration items and have 4 base attributes: attack's speed, damage, radius and level. Upgrade items level depend on totem level — it's not possible to use level 2 items for level 1 totem, but possible use level 1 items for level 2 totem. This would work well for balance. Thank you SO much for keeping this updated well into 2018. It's one of my favorite mods. The aesthetic fits perfectly with minecraft. It is also high quality. There is no crafting recipes for the "faces" which are required to craft a totem. Am I missing something? I saw a face in the logs, so I used a 'silk touch' axe on it, and all I got was the normal log. How do I extract the faces for use in recipes? Thanks. You need axe without Silk Touch now. It's a bug. can you add abililty to disable the upgrading system ????? Hello! I didn't understand what to disable? You can use CraftTweaker and rewrite any recipes (or rewrite JSON recipes within jar file) as you want. Dynamic Trees isn't compatible with any mod trees, check Dynamic Trees mod description on curse. I do not understand how the chests are related to my mod. Remove upgrade recipes from recipes dir in jar or with CraftTweaker. Maybe later. I have no many time and no plans to further develop the mod, I just upgrade code and prepared everything for porting to 1.13.
cool mod! but needs more explication! Thanks for your feedback. Can you tell me your vision of this? Maybe some kind of symbiosis with the Totemic mod is possible? hi nice mod but jus wondering is there any requirements for totem trees to grow as mine has been a sapling for a lot of m/c days and does not respond to bone meal. Too small chance for bonemeal (try in creative) and grow naturally. I added a config for the chance. Please check new version for mc1.12.2!